This latest in my series of stupid blog titles is a nod to the fact that I have to drag my sorry arse up the painfully steep Booth Street hill to get from my house on Primrose to Chinatown on Somerset. But it is very much worth the climb. You see, in addition to the fantastic mock meats about which Neil has recently blogged, China town is home to many other vegan delights. 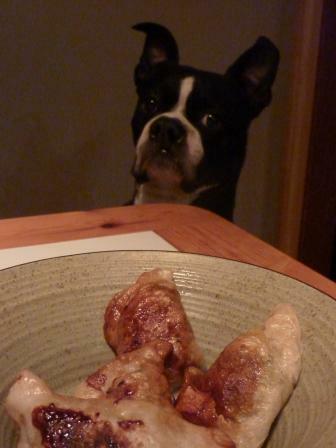 Today I’d like to highlight the wonton. A wise man (Neil) once said that all things are better when they are wrapped in dough. Unfortunately, when we vegans try to live this truth we are thwarted by the numerous stupider men who decided put eggs in all the wonton wrappers stocked by mainstream supermarkets. Happily, pretty much every one of the 80,000 or so grocery stores in Chinatown stocks vegan versions (an ironic exception is Phuoc Loi, faux meat destination). To ensure that you don’t get eggy ones, just harken back to your days of eating snow. Remember what your mother told you: White, “Ok,” Yellow, “No Way!” Or just read the ingredients. 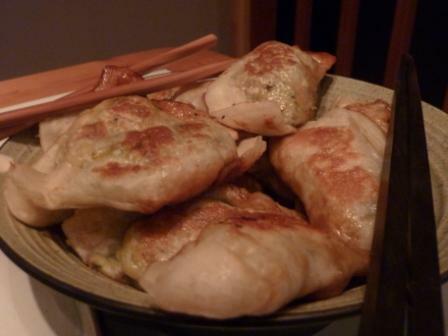 There are lots of great wonton recipes on vegweb.com, but you hardly need one. Just finely mince (slapchop!) about a cup each of onion, carrot, celery, plus whatever other veggies you fancy; add some salt, pepper and spices (Chinese 5-spice powder is good) and cook over medium heat until soft. I strongly advise also adding some minced faux meat – preferably mushroom chicken, beef, or mutton. I used Nelakee’s “pork steaks” tonight and they were great, too. Once the filling is done, put about a tablespoon into each wonton and seal the edges (just squish ‘em together – no water or anything needed). Next, fry them in a bit of oil until each side is golden brown. Finally, stir up a sauce made of equal parts water, soy sauce and fruit juice and toss in a few slices of garlic and ginger. You should have enough sauce that it will fill your frying pan about one inch from the bottom. Pour the sauce into your pan, put the lid on, steam for 5 minutes, and serve. They finished wontons are best dipped in soy sauce or in a 1:1 mixture of soy sauce and vegetarian oyster or stir fry sauce. These items also available in most Chinatown shops. 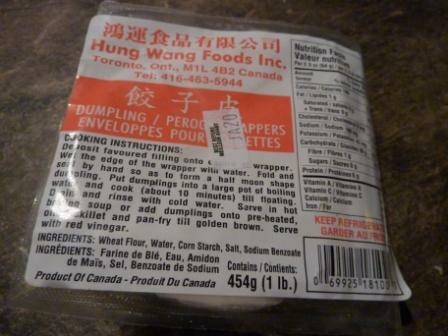 These wontons are also fabulous to use for making vegan ravioli! Just curious, as I really do not know the answer. What do vegans feed their cats and dogs? I have a cat that eats meat of course, friskies canned meat and fish. Am I not adding to the envirnomental and ethical impact of meat production? Just an honest discussion for my thoughts, thanks.